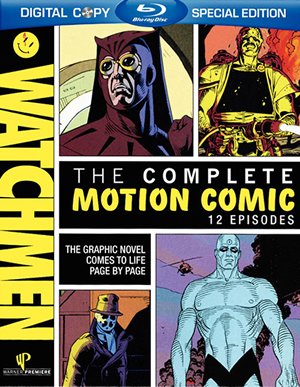 [url=http://www.index-dvd.com/blu-ray-watchmen-motion-comics-14686.html][img]http://www.index-dvd.com/coversbd/300/watchmencomics-bd-300a.jpg[/img][/url] [url=http://www.index-dvd.com/blu-ray-watchmen-motion-comics-14686.html][b][size=4]Watchmen Motion Comics[/size][/b][/url] Lanzamiento en Blu-Ray: [b][color=green]Martes 3 de marzo de 2009[/color][/b] Ever since July of 2008, Warner Premiere has been releasing episodes of the Watchmen Motion Comics which brings the original comic artwork to life through animation. Each episode of the Watchmen Motion Comics will be made available via iTunes, Amazon Video on Demand, Xbox Live and the Sony PlayStation Store and can be downloaded using the links below. Summary editions of the Watchmen Motion Comic are available to Verizon Wireless V Cast customers as well as Sprint TV customers via the DC Comics Channel.